Deep in the Egyptian desert, a handful of people searching for a long-lost treasure have just unearthed a 3,000 year old legacy of terror. Combining the thrills of a rousing adventure with the suspense of Universal`s legendary 1932 horror classic, `The Mummy`, starring Brendan Fraser, is a true non-stop action epic, filled with dazzling visual effects, top-notch talent and superb storytelling. The stunning special effects, the wonderful costumes, the thrilling storyline and a great cast. Yes, this is The Mummy. I found this film superb and was great as I sat and watched it with my family. The special features were very cool to, especially on the walking zombie/mummy scenes. The storyline was well thought out and easy to follow. It`s been a while since I watched such an "Indiana Jones" wannabe. And a good one as well. I`d call this movie an adventure-comedy. A lot of both, I guess. The extra stuff is very extensive and tells you just about as much as you need to know about ancient Egypt. a classic movie on a classic dvd.the nearest thing to a indiana jones movie since the last crusade.universal pulled out all the stops.are you listening paramount. The Mummy is a highly enjoyable film, one which you can just disconnect your brain and go with the flow. While it may not exactly be Schindlers List or Goodfellas it has a light hearted charm which makes for great popcorn viewing. Universal has done a great job with the disk and the picture has to be seen to be believed, the sound is also top notch. Included in the special features are- Theatrical trailer, information about ancient Egypt, Commentary and making of. When i first purchased a DVD player i was obviously blown away by the picture quality with the first couple i bought. 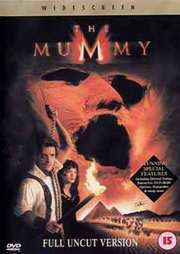 However when i put the Mummy on i couldn`t believe my eyes! The whole disk is a visual treat and must be ( along with Toy Story 2) the best picture quality yet seen on region 2 DVD. Looks great, sounds great, and the extras are informative. As for the film itself, Rachel Weisz has some nice lines, but Brendan Fraser just doesn`t cut it as an action hero, the film is not as exciting or as amusing as it could have been, and it`s certainly no horror film. 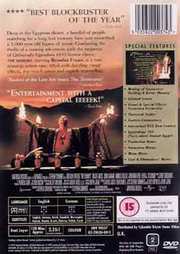 A poor man`s Raiders of the Lost Ark! Mine is the 2 disc set with DTS sound. For sure it`s no Indiana Jones, but has its moments. And on the second time I saw it it even looked better. Maybe it improves with viewing. Video transfer is amazing, colors and details are superb. DTS sound rocks. Extras add a few more items to the previous version (non DTS, single disc), but are interesting anyway, with a feature on The Mummy Return (without Margaret Tatcher...). A very entertaining action/adventure movie for all of us orphans of Indiana Jones. Has its value, specially if your equipment can play DTS sound.